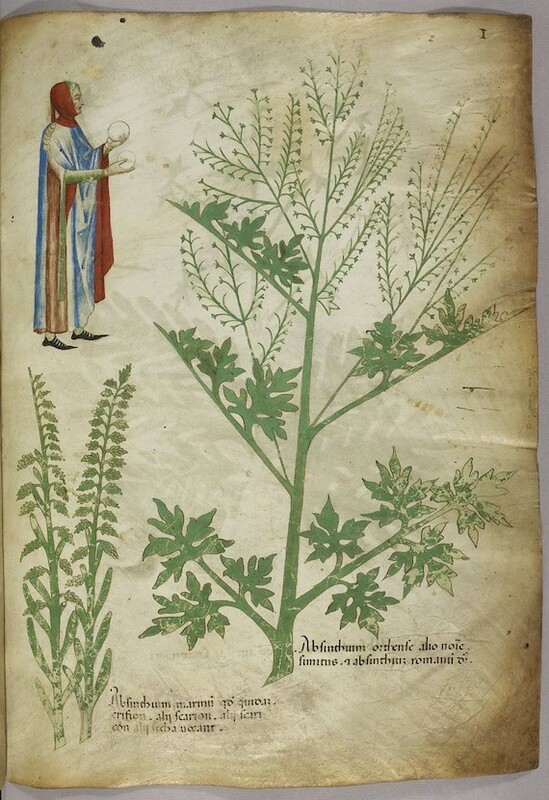 Selections from a beautifully illustrated 15th century version of the “Tractatus de Herbis”, a book produced to help apothecaries and physicians from different linguistic backgrounds identify plants they used in their daily medical practice. 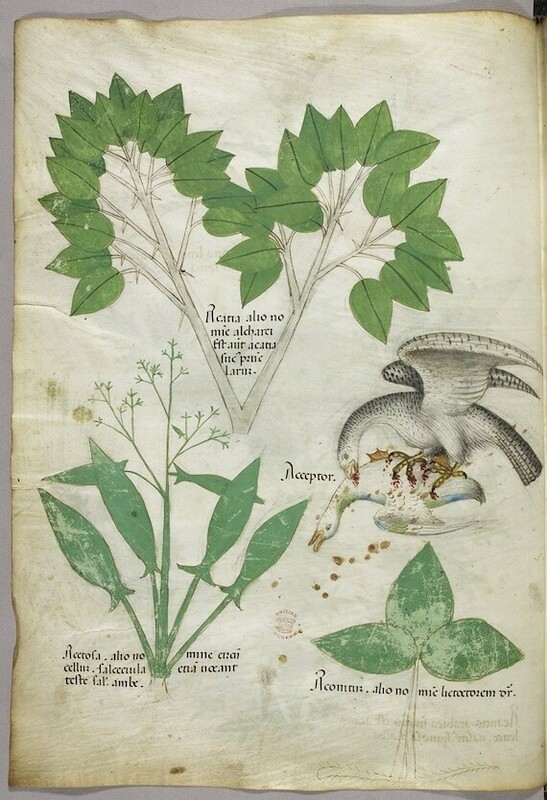 No narrative text is present in this version, simply pictures and the names of each plant written in various languages – a technique which revolutionised botanical literature, allowing as it did for easier transcultural exchanges of scientific knowledge. 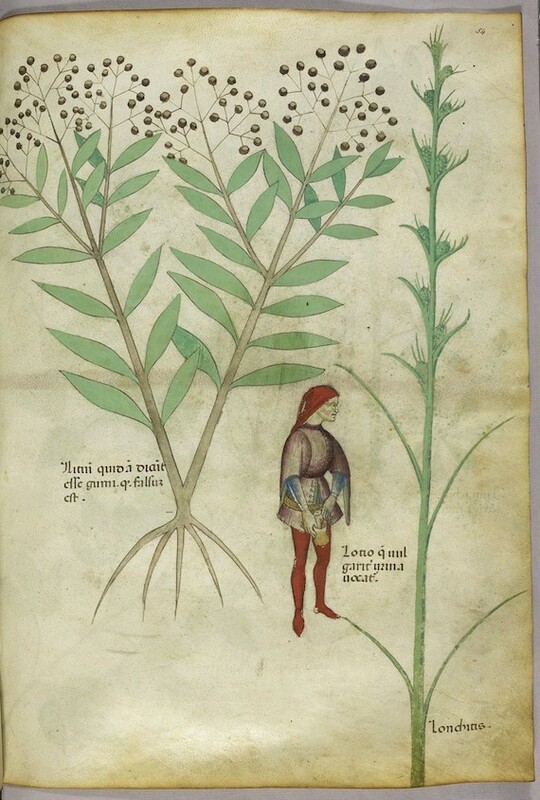 This particular “Tractaus de Herbis”, thought to date from around about 1440 AD and known as Sloane 4016 (its shelf-mark in the British Library), hails from the Lombardy region in the north of Italy and is a copy of a similar work by a figure called Manfredus, which itself was a version of the late 13th century codex known as Egerton 747. 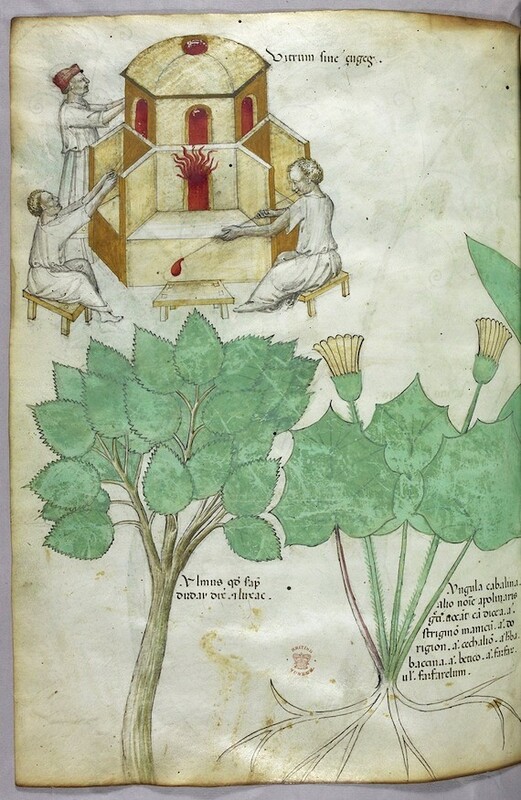 As Minta Colins writes in Medieval Herbals: The Illustrative Traditions (University of Toronto Press, 2000), as opposed to these early versions, this sumptuously illustrated 15th century copy was most likely created with the wealthy book collector in mind rather than the physician, as “the primary scientific purpose had by then given way to the bibliophile’s interest”. Some of the delightful highlights of the selection given below include: a demon repelled; a trio of mouse, cat and human corpse; an animal engaging what seems to be a spot of self-castration; an aphrodisiac induced scene; and a man slyly urinating into a pot. 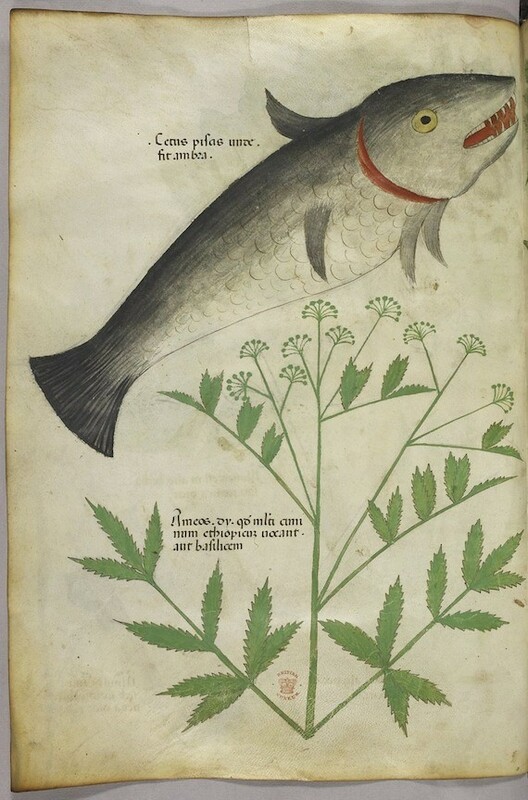 Miniatures of a plant and a fish. 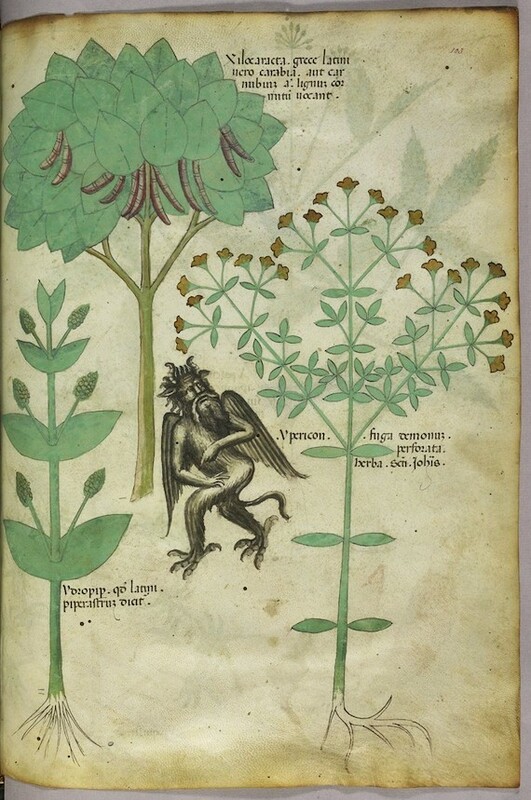 Miniature of plants and a demon: the herb Ypericon, supposed to repel demons. 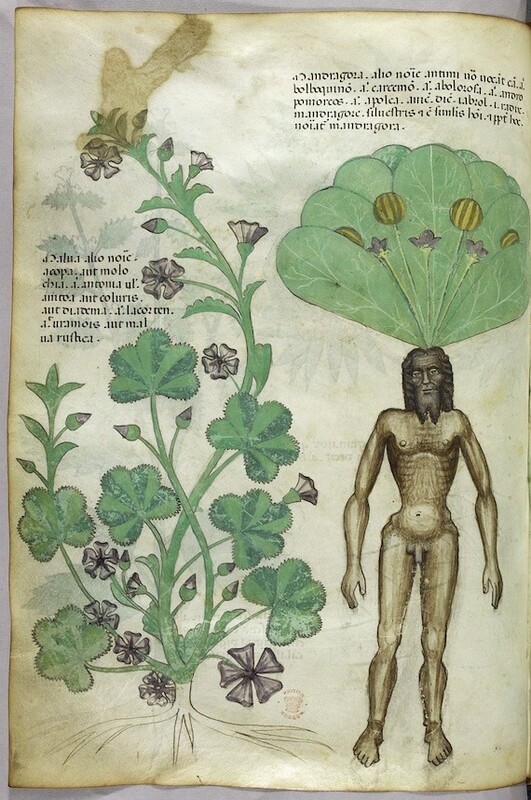 Miniature of plants, including a mandrake plant with a naked male body as the root. Miniatures of plants, and of a bird of prey killing a duck. 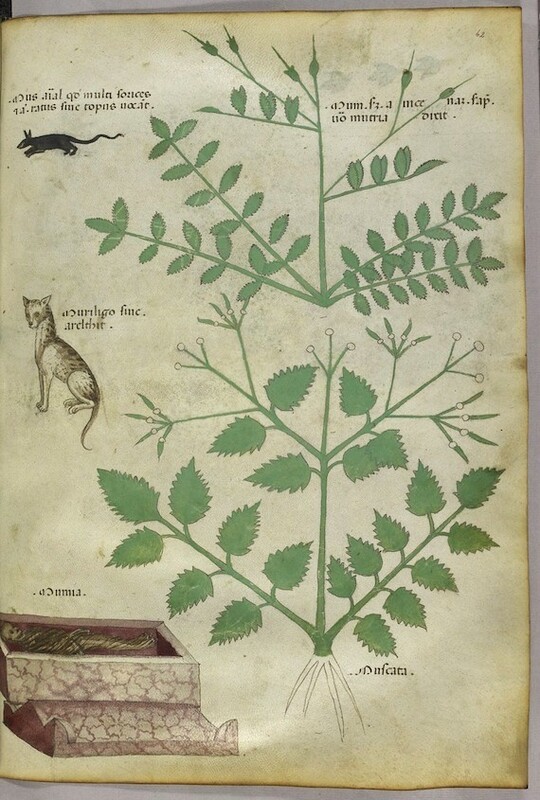 Miniature of plants, a rat, a cat, and a human corpse. 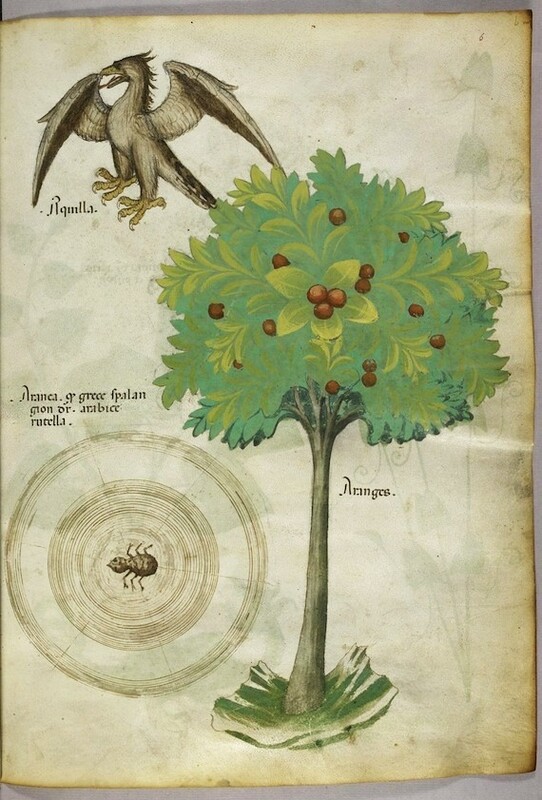 Miniature of a tree, a spider web, and an eagle. 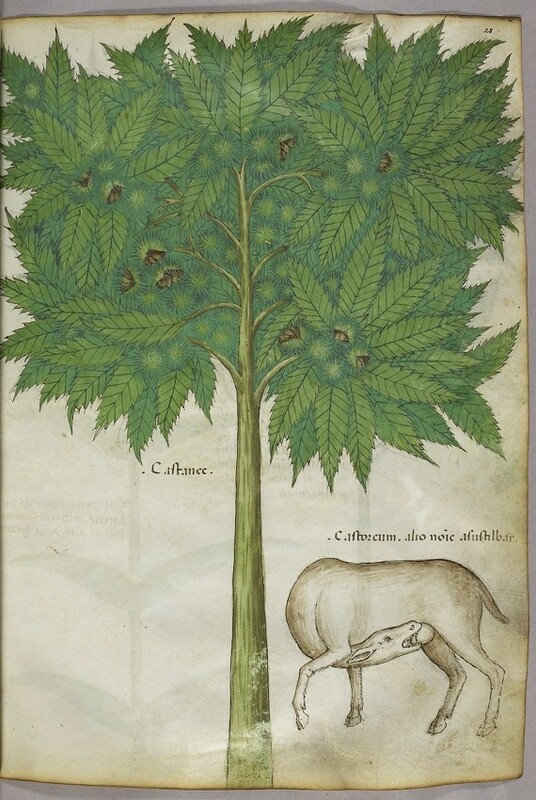 Miniature of a tree and an animal castrating itself. Miniatures of plants, and a man urinating into a pot. 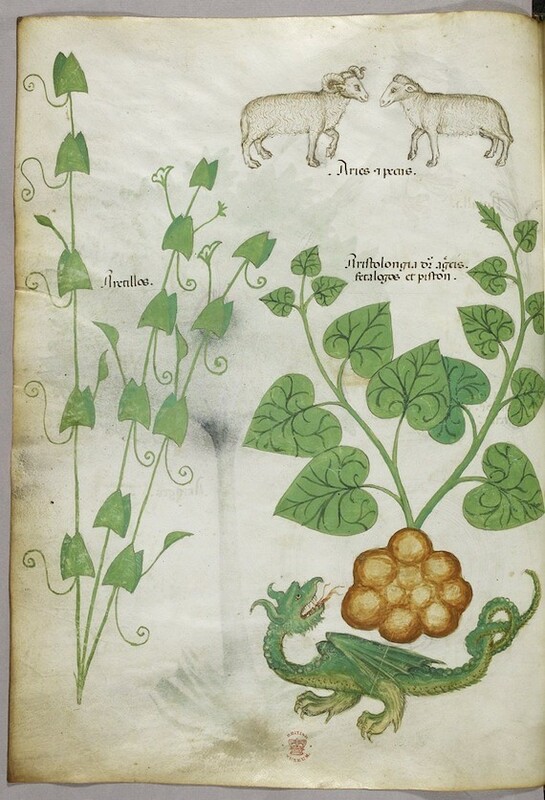 Miniatures of plants, sheep, and a dragon. 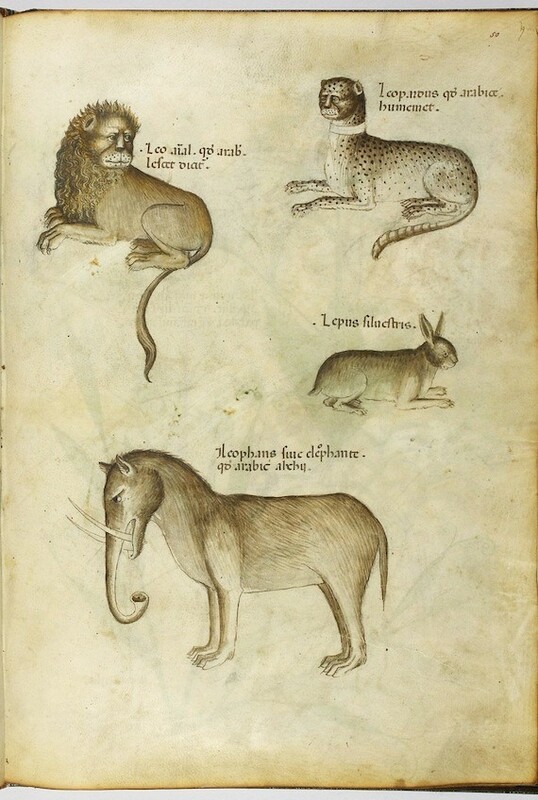 Miniature of a lion, a leopard, a rabbit, and an elephant. 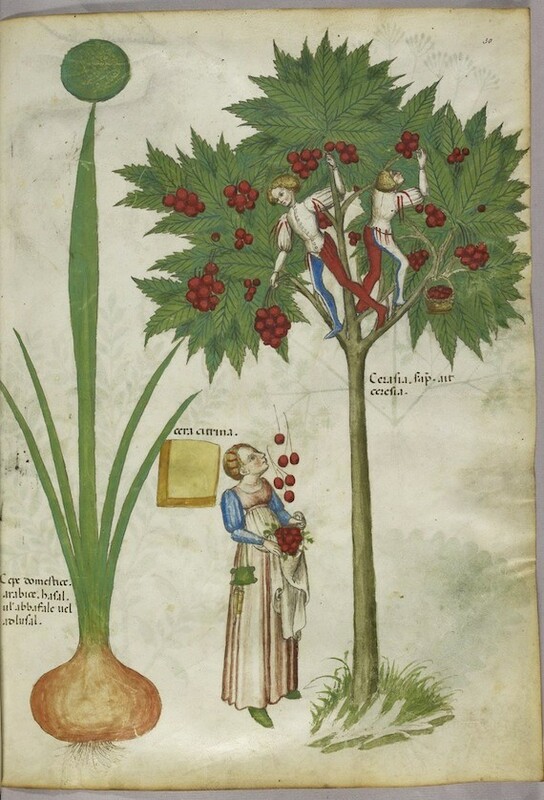 Miniature of a plant and boys standing in the branches of a fruit tree picking fruit and thowing down to a woman standing below. 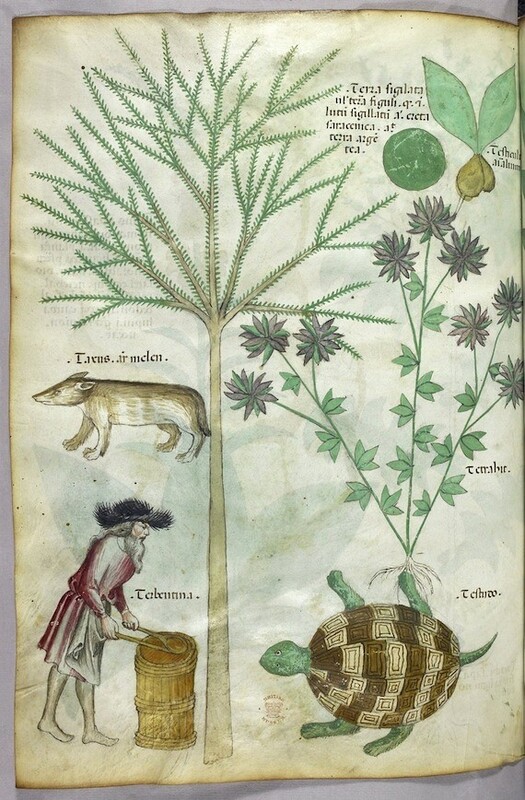 Miniatures of plants, a turtle, a man and another animal. 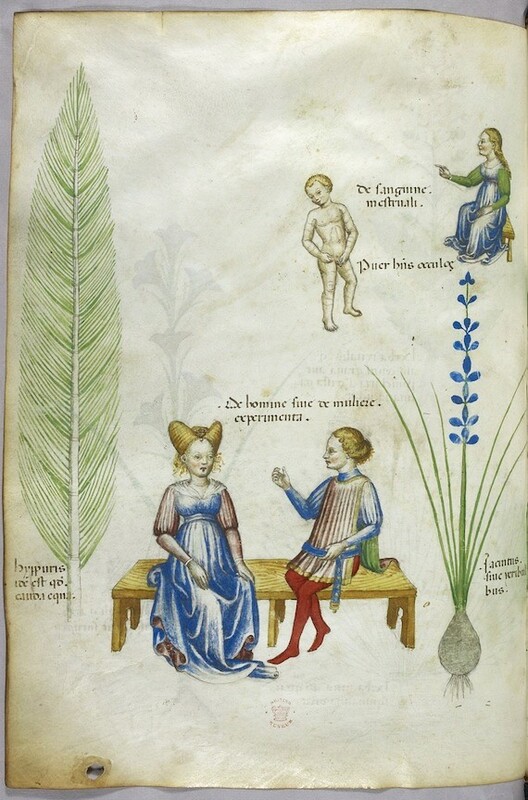 Miniature of the plant Hyppurius (field horsetail), on the left, with a man and a woman sitting on a bench in the middle labelled ‘De homine sive de muliere experimenta’, illustrating the effects of an aphrodisiac, with Jacinta or hyacinth on the right, an aid to urinary problems and menstruation, with a naked boy and seated woman above the plant. Miniatures of plants and men in the process of glass-making. 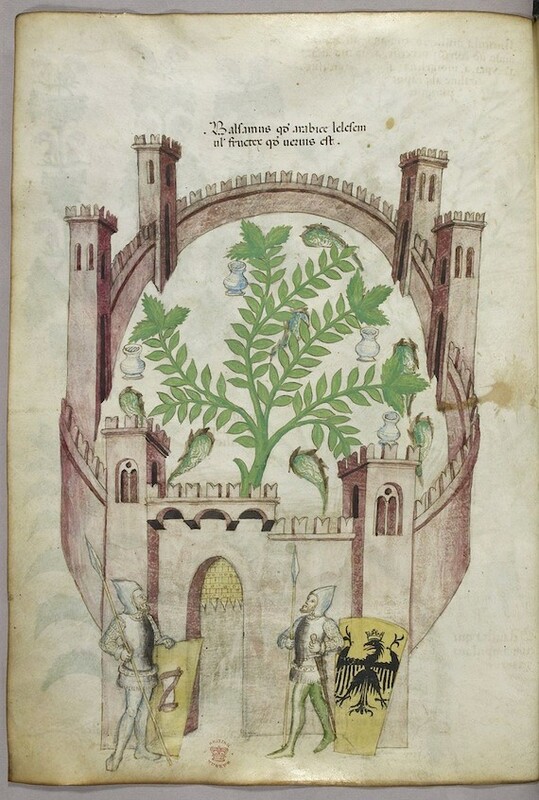 Miniature of the balsam garden of Cairo (Fustat), with seven pools of water and jars to catch the balsam, a plant in the centre, with two knights in armour flanking the gate, with shields with heraldic arms.